We are back with a bang offer i.e., P(Freebies) C R Paatil Tirang Offer - Get Free Tirang by filling simple Form. 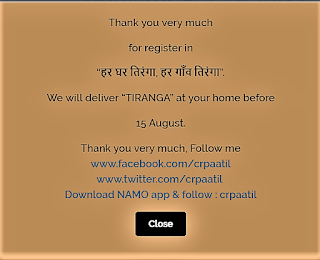 In this post you're going to know about an awesome (Freebies) C R Paatil Tirang Offer - Get Free Tirang by filling simple Form. As per Indian Flag Code 2002, on Republic Day and Independence Day only a Tri-color flag made up of Khadi can be flagged, this Tri-color flag cannot be used for flag hosting. 1. No flag or emblem should be placed either above the National Flag or to its right. 2. All other flags to be placed to the left of the National Flag if they are hung in a line. The National Flag shall be hoisted first and lowered last. 3. The National Flag shall be hoisted on the top than any other flags. 4. When the Flag is carried in a procession or a parade, it shall be either on the marching right, i.e. the Flag's own right, or if there is a line of other flags, in front of the centre of the line. 5. When the National Flag is displayed from a windowsill, balcony, or front of a building, the saffron band shall be upper most. 6. The National Flag shall be flown from sunrise to sunset, irrespective of weather conditions. The Flag shall be bought down at night. 7. On all occasions for official display, only the Flag conforming to specifications laid down by the Bureau of Indian Standards and bearing their standard mark shall be used. On other occasions also, it is desirable that only such Flags of appropriate size are flown. 1. Wherever the Flag is flown, it should occupy the position of honour and be distinctly placed. 2. Where the practice is to fly the Flag on any public building, it shall be flown on that building on all days including Sundays and holidays and, except as provided in this Code, it shall be flown from sun-rise to sun-set irrespective of weather conditions. The Flag may be flown on such a building at night also but this should be only on very special occasions. 3. The Flag shall always be hoisted briskly and lowered slowly and ceremoniously. When the hoisting and the lowering of the Flag is accompanied by appropriate bugle calls, the hoisting and lowering should be simultaneous with the bugle calls. 4. When the Flag is displayed from a staff projecting horizontally or at an angle from a windowsill, balcony, or front of a building, the saffron band shall be at the farther end of the staff. 5. When the Flag is displayed flat and horizontal on a wall, the saffron band shall be upper most and when displayed vertically, the saffron band shall be to the right with reference to the Flag, i.e., it may be to the left of a person facing it. 6. When displayed over the middle of a street, running east-west or north-south, the National flag shall be suspended vertically with the saffron to the north, or to the east as the case may be. 7. When the Flag is displayed on a speaker's platform, it shall be flown on a staff on the speaker's right as he faces the audience or flat against the wall above and behind the speaker. 8. When used on occasions like the unveiling of a statue, the Flag shall be displayed distinctly and separately.